Thanks to generous donations from our supporters, The Joan Gaeta Lung Cancer Fund worked with CBS Outdoor and developed a billboard to raise awareness of lung cancer. 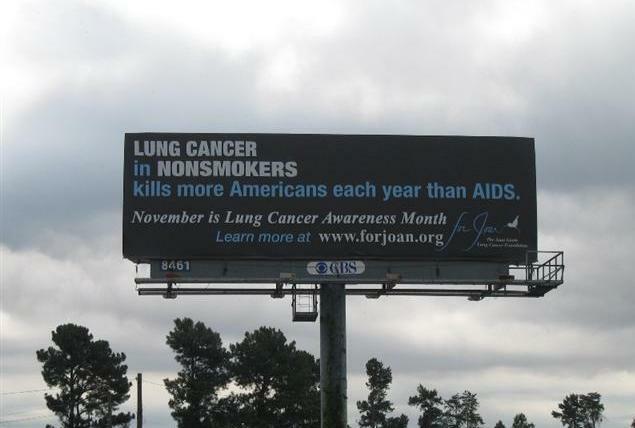 The billboard, near Lake Lanier in Gainesville, Georgia, informed passers-by that, indeed, lung cancer in non-smokers kills more Americans each year than AIDS. It was strategically located near a high-traffic, commercial intersection for maximum viewership (Best Buy, Home Depot, Publix, Chili's, Outback Steakhouse, Starbucks, etc.). It ran from the middle of October through November of 2009. Again, we cannot spread the word without the financial support of people like you. Thank you very much! Check out our 2010 Billboard HERE.